Fisheries Minister Hon. Alvin Dabreo on Thursday created history, as the first Minister with responsibility for Fisheries to get into a scuba diving gear and dive a marine protected area (MPA) to apprise himself first hand on information regarding the functioning of the MPA. 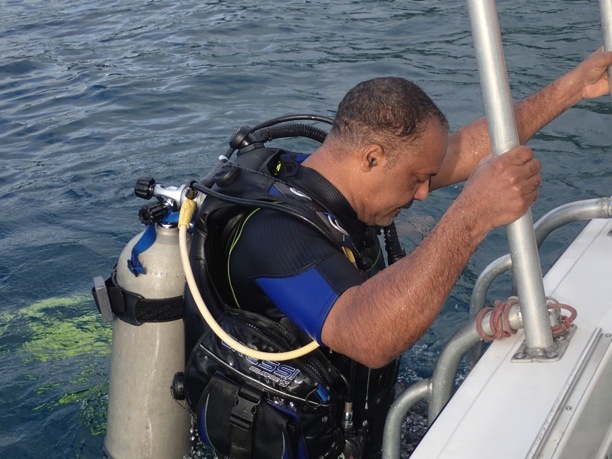 The Minister, who was accompanied by the Chief Fisheries officer Justin Rennie, the National MPA Coordinator Roland Baldeo, and MPA Biologist Olando Harvey, conducted an exploration dive on Thursday under the guidance of local diving instructor Adrian Blackman of Native Spirit Dive Shop. The objective of Thursday’s exercise was part of a fact-finding mission observing the functioning of the MPA and exploring a possible new MPA site in the area off the fishing town of Gouyave. Shortly after surfacing from beneath the water, the Minister said he was delighted to have been given that opportunity, and pledged Government’s continuing support in the protection of Grenada’s Marine environment as it is of critical importance for livelihoods and fisheries. The Minister further hinted that Government is in the process of implementing a new management structure for MPAs throughout Grenada. This proposed new structure, he noted, is likely to go into effect early in the New Year and would provide for a broader community and stakeholder involvement in the management of MPAs. Minister Dabreo is, however, concerned about the level of pollution found on the seabed, that poses a direct threat not only to the MPA, but marine life on the whole, and calls on person to be mindful of the type of waste and place of deposit, since much of this waste finds its way into the sea, and contributes to an unhealthy marine environment. Grenada presently has three functioning MPAs: Sandy Island in Carriacou, Woburn Clarkes Court Bay, and Moliniere Beasejour MPA, and soon to be implemented Gouyave and Grand Anse MPAs. National MPA Coordinator Roland Baldeo said he was pleased with Thursday’s exercise, and he was most heartened to have both the Minister of Fisheries and the Chief Fisheries Officer in a diving expedition in one event— a first, he said, for Grenada, and one that speaks volumes for the future management of marine protected areas.